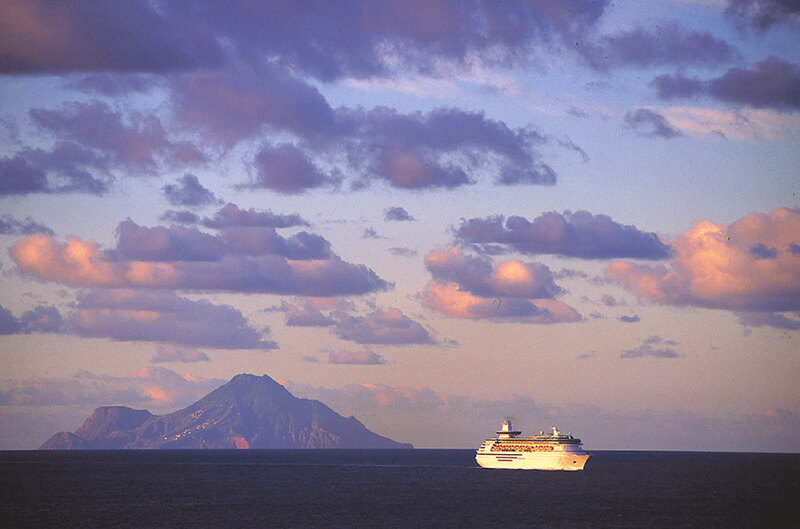 A cruise through the Caribbean is usually tranquil. Everyone in the Caribbean breathes a collective sigh of relief when the annual Atlantic hurricane season draws to a close at the end of November. Some years are worse than others for catastrophic storms and the path and intensity of these tropical cyclones is always unpredictable. However, the Caribbean is a vast sea, covering a million square miles, and in any given year only a few of its hundreds of islands are hit by a hurricane. The islands can’t dodge bad weather but cruise ships can avoid approaching storms during hurricane season. In some cases a ship will completely bypass one port for another. 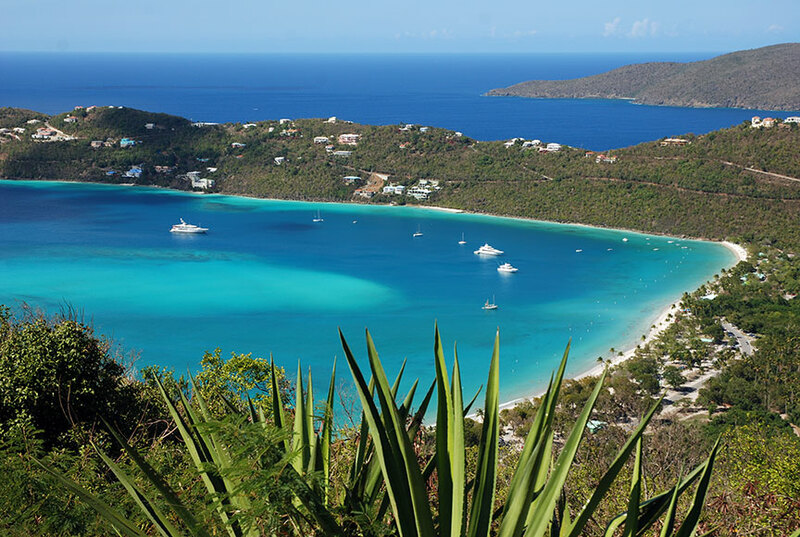 One November our ship’s scheduled stop at St. Thomas was changed to Tortola in the British Virgin Islands due to damage the U.S. Virgin Islands had sustained from a recent hurricane. 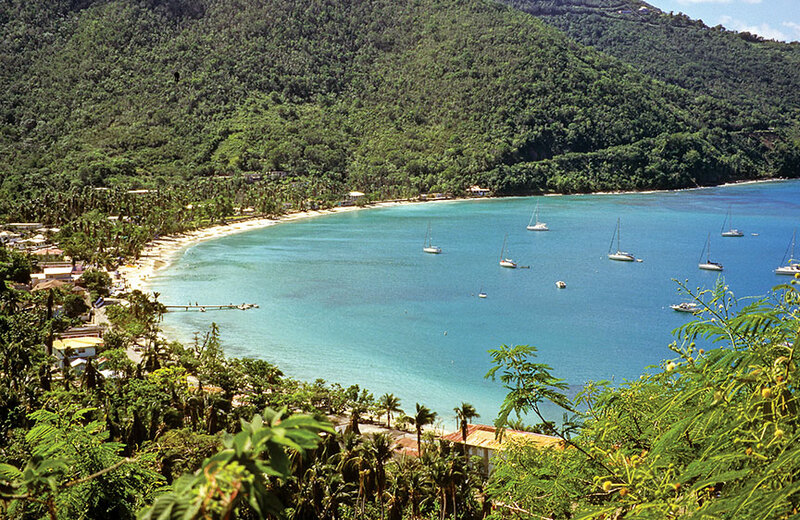 When we returned to the Caribbean a few months later, our ship call at St. Thomas revealed little evidence of the earlier storm and it was business as usual as we toured the tropical island and visited postcard-perfect beaches. When disaster does strike during hurricane season, the cruise industry is one of the first to come to the aid of these small island nations, often delivering supplies and providing shelter and transportation in a storm’s immediate aftermath. Port facilities in the Caribbean have been built for hurricane resistance, so that ship piers and terminals can weather these storms. 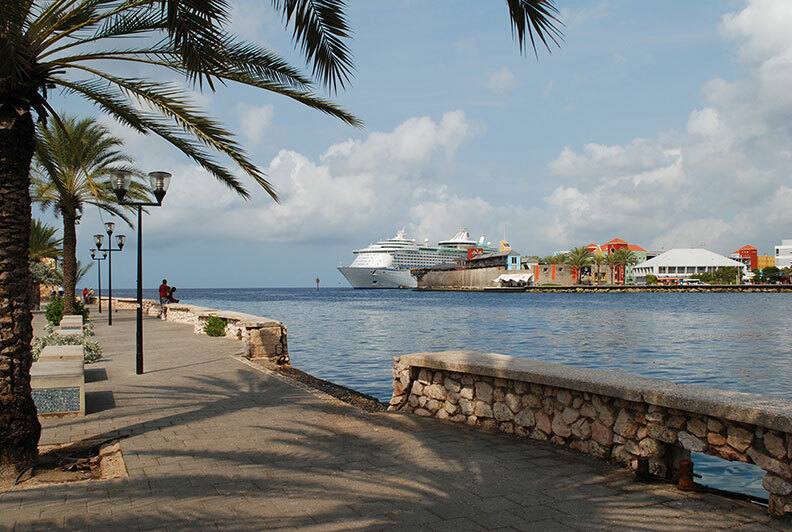 The port of St. Maarten recovered quickly from Hurricane Irma. The 2017 hurricane season was particularly devastating for several Caribbean destinations. 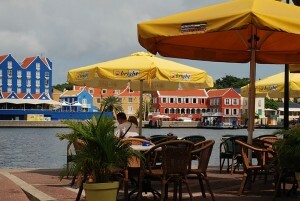 While the other islands continued to receive visitors, the affected islands rebuilt and are once again open for business. 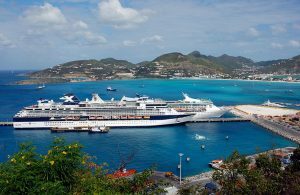 St. Maarten’s recovery efforts began immediately and its cruise calls have returned to pre-hurricane numbers. The BVIs have also rebounded and are now receiving more cruise passengers than ever, as is Puerto Rico, which was hard hit by Hurricane Maria. St. Thomas and St. Croix have also been busy repairing and rebuilding in preparation for this winter’s cruise season. Magens Bay on St. Thomas remains one of the most beautiful beaches in the world. 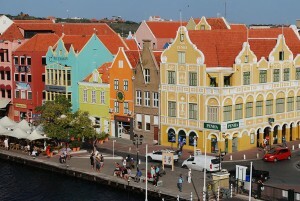 With its expansive size and diversity of destinations, the Caribbean is a resilient cruising area. All of the major cruise lines deploy ships to the region, especially during the winter months. With more than 60 different ports in 28 countries or territories to choose from, the selection of cruise itineraries is varied, exhaustive and competitively priced. Hurricane seasons come and go, but the appeal of the Caribbean – the world’s largest market for cruise vacations – remains strong year after year. 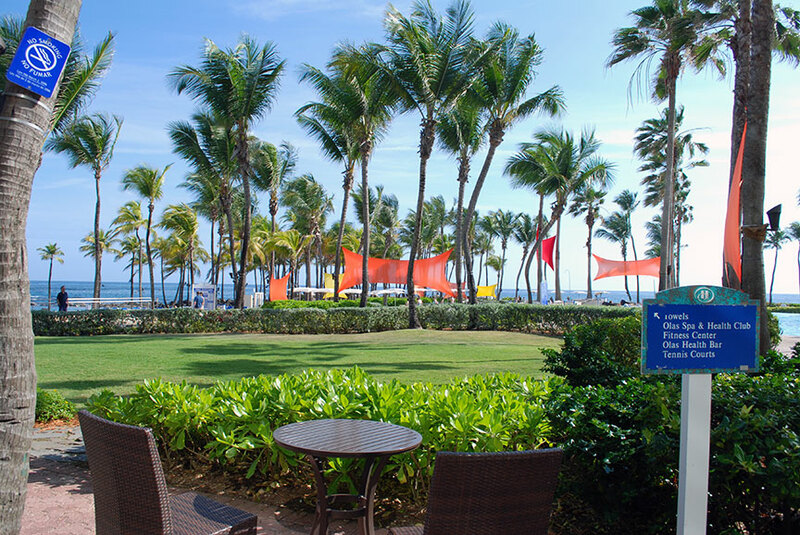 The lush grounds of the iconic Caribe Hilton in San Juan. When Hurricane Maria slammed into Puerto Rico in September 2017, the devastation resulted in thousands of lives lost and an infrastructure in ruins as communities struggled without power or running water. Emergency aid to this U.S. territory was slow in coming but Oxfam America stepped in to help, as did others. Among those who assisted with relief aid was Alex Cora, who was born and raised in Puerto Rico and is the manager of the 2018 world champion Boston Red Sox. There are many reasons to visit the scenic island of Puerto Rico, including the opportunity to embark on a Caribbean cruise from the Spanish-founded port of San Juan. This vibrant city’s historic walled town – Old San Juan – contains one of the best-preserved fortresses in the Americas and its cobbled streets are lined with intriguing shops and restaurants. 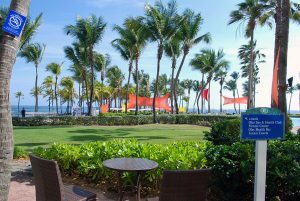 When embarking on a cruise from San Juan, I always spend a few extra days there and my hotel of choice is often the Caribe Hilton. Situated at the edge of Old San Juan, on a peninsula with a secluded beach and lush gardens, this hotel resort opened in 1949 and was the first property operated by Hilton Hotels outside the continental U.S. Famous guests at the hotel’s grand opening included Gloria Swanson and David Rockefeller, and the hotel became the setting for Hunter S. Thompson’s The Rum Diary. An early bartender is credited with inventing Puerto Rico’s official drink – the Pina Colada – when he served guests a new cocktail containing rum with coconut cream and pineapple juice. On my most recent stay at the Caribe Hilton my drink of choice was champagne by the glass. While live salsa music pulsated through the open-air bar, my husband and I strolled outside to sip our drinks beneath the swaying palm trees that dot the manicured grounds. Our mornings were spent visiting some of the city’s historic spots, including the massive El Morro fortress, and strolling along La Princesa – a waterfront promenade which winds past outdoor cafés and fountain-filled plazas. We would return to the hotel for relaxing afternoons spent poolside. The hotel is completing a $100 million property-wide renovation and will reopen in time to celebrate its 70th anniversary in 2019. Its beach lost sand during Hurricane Maria but regained it a few months later during a storm tide. As for Maria, the name has been retired from the rotating lists of the World Meteorological Organization due to the extensive damage and loss of life wreaked by this deadly storm. Maria will never again be used to name an Atlantic hurricane. All cruise ships maintain high guardrails to ensure passenger safety. (Travel Pulse) Anyone who’s previously embarked on a cruise ship realizes it’s virtually impossible to “fall” overboard. Among other realities, the chest-high, sturdy iron railings aboard contemporary cruise ships ensure that only guests intent on engaging in risky or suicidal behavior end up overboard. But for the millions of leisure travelers who’ve never been aboard a cruise ship—or a ship of any sort for that matter—media reports of passengers “falling” off are concerning. In Facebook posts discussing the most recent highly publicized overboard incident, one travel agent complained some of her prospective first-time cruisers were now terrified of “falling off” their ship, should they choose to cruise. The idea of facing a life-threatening situation while vacationing is naturally a sobering matter. However, media characterizations of overboard incidents, no doubt motivated at least in part by sensitivity to victims and their loved ones, routinely describe passengers as “falling” overboard. So how should travel agents address this sensitive issue with prospective new cruisers? Well, it’s best to begin with some facts. In its “Report on Operational Incidents, 2009 to 2017,” commissioned by the Cruise Lines International Association (CLIA), U.K.-based analyst G.P. Wild studied a wide range of shipboard operational incidents—including passengers and crew going overboard. The firm consulted sources including International Maritime and nautical organizations, trade and shipping industry publications, major newspaper and magazine accounts and cruise-line representatives. The study also reported an average of 18.2 overboard incidents per year involving passengers and crew between 2009 and 2017. Annual cruise passengers grew from 17.8 million to 26.7 million during the same period. Thus, overboard incidents represent an infinitesimal total compared with the millions of travelers who cruise each year. Simply put, such incidents are extremely rare. Perhaps the most effective way to convince potential first-time cruise travelers that “falling” overboard is extremely unlikely is with a generous dose of truth. “People just don’t ‘fall overboard’ from a cruise ship,” said Stewart Chiron, a Miami-based cruise expert who is also one of the country’s top cruise vacation sellers. “It occurs because of extremely poor judgment, carelessness or on purpose by the person(s) involved,” he said. Perhaps it’s easy for those who haven’t cruised to believe they could “fall” from a ship. Despite its evolution from a travel industry niche to a mainstream vacation over the last 20 years, cruising remains shrouded in myths that have proven hard to shake. These included the notion that cruise ships were confining, that only old and wealthy people ever took cruises, that cruises were a nonstop food fest and finally that there was “nothing to do” aboard cruise ships. Such issues pale in comparison with a person going overboard, but they do indicate how little most people know about contemporary cruise vacations. Yet each year more and more people cruise and discover what I’ve always found to be true: cruises offer a flexible, surprisingly diverse and most of all safe and enjoyable vacation form. However, going overboard into the ocean is no joking matter. That’s why agents should stick to the facts when addressing the issue with potential cruisers. 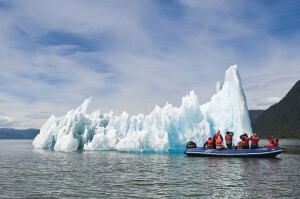 Seabourn Sojourn offers a luxury cruise experience in Alaska. Everyone, it seems, wants to see Alaska. 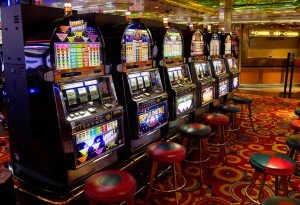 And many of us prefer to view the region’s magnificent coastal scenery from the decks of a cruise ship. The appeal of this vast northern state of glacier-clad mountains and majestic fjords is as strong as ever and the selection of cruise lines and itineraries servicing Alaska continues to grow. The city of Vancouver has long been the main turnaround port for cruises to Alaska and it now shares that status with Seattle. Most cruises out of Seattle are one-week round-trip itineraries while those from Vancouver cover a wider range of choices. These include round-trip cruises of the Inside Passage and one-way cruises to the Alaska ports of Seward or Whittier (both near Anchorage) where land tours to Denali are popular. 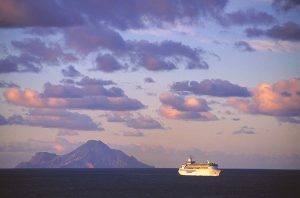 Several cruise lines also offer round-trip cruises to Alaska from the California ports of San Francisco and Los Angeles. For cruise enthusiasts, Alaska has never been easier to visit. The cruise lines servicing Alaska cover all categories, from contemporary to luxury to expedition. Some lines, such as Princess Cruises and Holland America Line, have been cruising to Alaska for decades and position a fleet of ships on the west coast throughout the May-to-October season. Other lines offering cruises to Alaska include Disney, NCL, Oceania and Royal Caribbean. In the luxury market, Crystal, Silversea and Regent Seven Seas have been joined by Seabourn, which returned to the region in 2017 after a 15-year hiatus. Cunard will be back in Alaska for the summer of 2019. Expedition cruising is also thriving in Alaska, where wilderness and natural beauty are the star attractions. Alaskan Dream Cruises, Lindblad Expeditions, Ponant, Un-Cruise Adventures and Windstar all offer off-the-beaten track voyages with a close-up look at the scenery. But even if you’re booked on a large ship, the shore excursions offered include wilderness adventures such as kayaking, hiking, whale watching and rock climbing, not to mention helicopter rides to sled dog camps where you can take a turn at mushing across a glacier. Expedition cruising includes sea adventures in Zodiac inflatables. For the best of both worlds, a luxury cruise on Seabourn’s 450-passenger Sojourn provides not only spacious accommodations and impeccable service but an expedition-style itinerary that follows narrow, twisting channels and stops at unspoiled hideaways, such as the Inian Islands, where the ship’s expert expedition team leads shore excursions in Zodiacs and sea kayaks. Sea otters are abundant in the waters off this cluster of small islands in Icy Strait, as are Pacific white-sided dolphins, orcas and humpback whales. No matter which cruise line you choose, Alaska’s wilderness will be sure to steal the show. 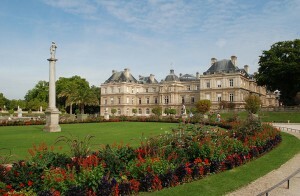 Luxembourg Garden and Palace in the Latin Quarter. Ernest Hemingway sought authenticity long before the term was coined in connection to travel. In fact, he often took up residence in the places he visited. He spent years living in Paris and later penned A Moveable Feast, which is both a memoir and a literary guidebook to that fascinating city. Lesser known but equally engaging is That Summer in Paris by Morley Callaghan, a Canadian author who met Hemingway when they were both young reporters working for a Toronto newspaper. Callaghan reconnected with Hemingway in 1929 when he and his wife travelled to Paris on a much-anticipated sojourn. An up-and-coming novelist, Callaghan was eager to experience the city’s thriving café culture and meet some of the famous authors living in the Latin Quarter, including F. Scott Fitzgerald and James Joyce. It was during that summer that he and Hemingway spent many an afternoon honing their boxing skills at the American Club’s gym. 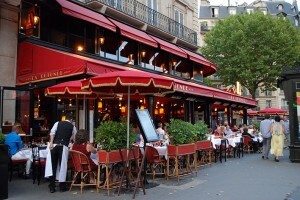 The café culture of Paris hasn’t changed much since Hemmingway’s day. On my last visit to Paris I was keen to see the places described by these two writers. My husband and I were staying in a three-star hotel just a block off Luxembourg Garden, so our mornings began with a stroll past the brilliant flower beds in front of Luxembourg Palace. This elegant 17th-century palace houses the French Senate and overlooks an ornamental pond where children launch vintage toy boats. 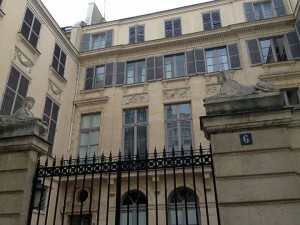 Hemmingway lived near Luxembourg Garden on Rue Ferou. When Hemingway first moved to Paris and was living on meager earnings from his short stories, he often had no money for lunch. So, to avoid the tantalizing aromas wafting from street cafés, he would walk instead through the beautifully manicured Luxembourg Garden. 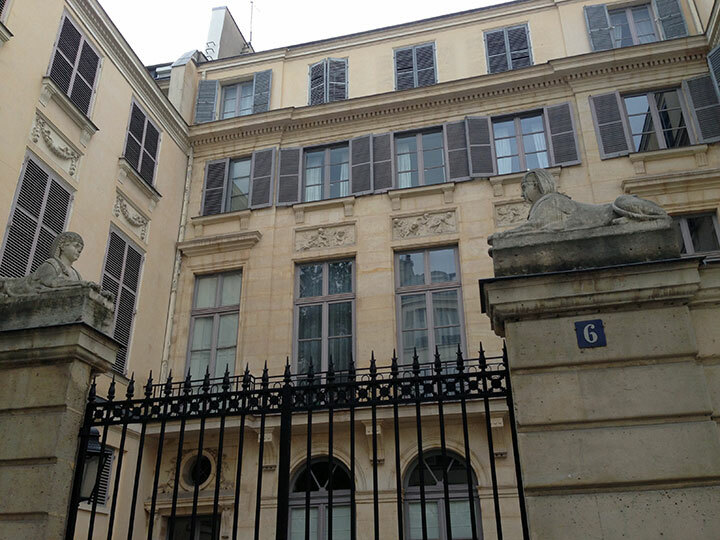 By the time Callaghan came to Paris and looked up his old newspaper friend, Hemingway was a successful novelist and living with his second wife in a fashionable apartment on rue Ferou. If you’re strolling along this cobblestoned lane, which leads from Luxembourg Garden to Place Saint-Sulpice, look for the stone lions mounted on the entrance pillars at the gated courtyard of 6 rue Ferou. 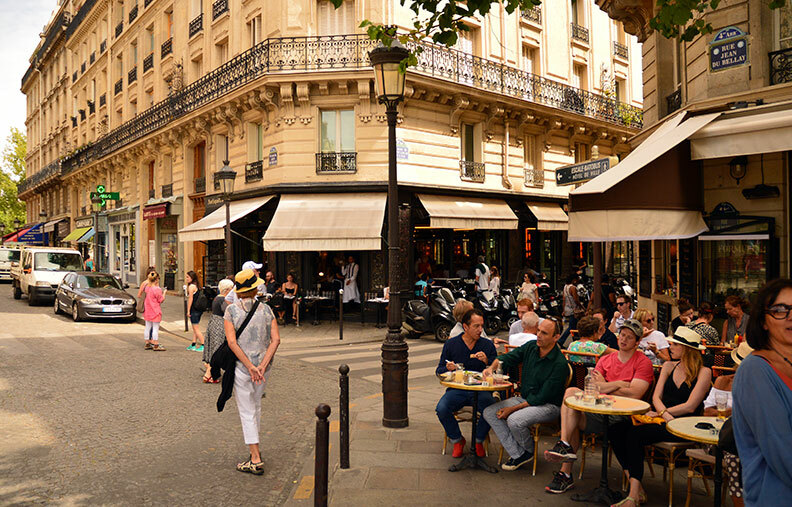 The famous Left Bank cafés referred to in the memoirs of Hemingway and Callaghan are all within walking distance of Luxembourg Garden. A block north of Place Saint-Sulpice are the famous cafés of St-Germain des Prés, where writers, artists and intellectuals of the 1920s would gather. However, we decided to try one of the restaurants on Boulevard du Montparnasse, a short walk south of Luxembourg Garden, where another cluster of iconic cafés is located. Famous La Rotonde restaurant on Boulevard du Montparnasse. La Coupole, Le Dome, La Rotonde and Le Select attracted the likes of Gauguin, Picasso and Hemingway to their tables. We decided to dine at Le Select because this was Callaghan’s favourite spot when he and his wife lived in Paris. Its art deco interior has been preserved and we could easily imagine Callaghan and Hemingway sitting here after their weekly boxing match, enjoying a drink and each other’s company. One our most memorable meals in Paris was lunch at the café in Luxembourg Garden. What better place to enjoy a croque-monsieur – that classic French bistro sandwich of ham and melted cheese – than at an outdoor table in a quintessential Parisian park. 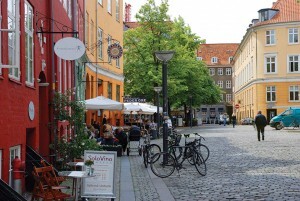 Danish streets and culture mesh in the sense of connectedness. We can all use a good hug now and then, and many a Dane practices hygge on a daily basis. They do this by taking time to enjoy life’s small pleasures, especially the sharing of meals with family and friends. If coziness is an essential part of hygge, no one does it better than the Danes, for they wouldn’t think of setting a dinner table without the warm glow of candles, and that dining table is probably Danish modern. Danish modern design is on display throughout Copenhagen – Denmark’s capital and a busy base port for Northern Europe cruises. A pleasing mix of old world charm and modernist architecture, Copenhagen is considered one of the world’s most livable cities. You can walk everywhere in the downtown core, where pedestrian-only streets include the mile-long Strøget, its five interconnecting streets lined with shops selling an array of Danish products. These include handpainted porcelain, damask tablecloths, fine table linens and wooden toys. Amid the selection of shops along the Strøget are cafés and coffeehouse serving mouth-watering pastries and freshly-brewed coffee. After admiring the 17th-century architecture at Kongens Nytorv (King’s New Square) you can pop into Reinh Van Hauen bakery for a tasty cinnamon roll called kanel-snegl. Delicious layer cakes, including a chocolate and coffee mousse creation honouring the Danish author Karen Blixen, are served in La Glace patisserie at Skoubogade 3, just off the Strøget. 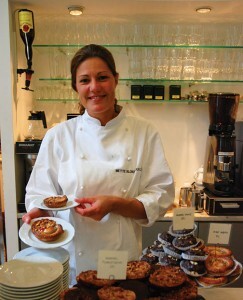 Danish pastries served with a smile in the Winter Garden Cafe. After strolling the length of the Strøget, from King’s New Square to City Hall Square, you’ll be ready for lunch at Ny Carlsberg Glyptotek, an art museum founded in 1897 by the brewing magnate Carl Jacobsen. The museum’s domed courtyard is bright and airy and the perfect spot to pause for a light lunch in its Winter Garden café. Close by are the famous Tivoli Gardens – an amusement park of twinkling lights, flower gardens, rides and restaurants which first opened in 1843. King Christian VIII authorized its construction upon hearing the convincing argument that people amusing themselves do not think about politics. When Walt Disney began planning Disneyland, he drew inspiration from the magical atmosphere created at Tivoli Gardens. 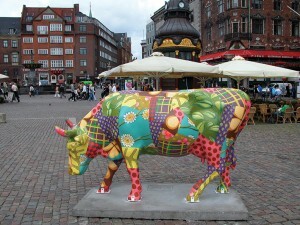 Modern street art adorns the Strøget. Opposite the Tivoli Gardens is a statue of Hans Christian Andersen, immortalized as the author of such beloved fairy tales as The Ugly Duckling and The Little Mermaid. A bronze statue of the Little Mermaid sits demurely on a shoreside boulder in Copenhagen’s harbour. 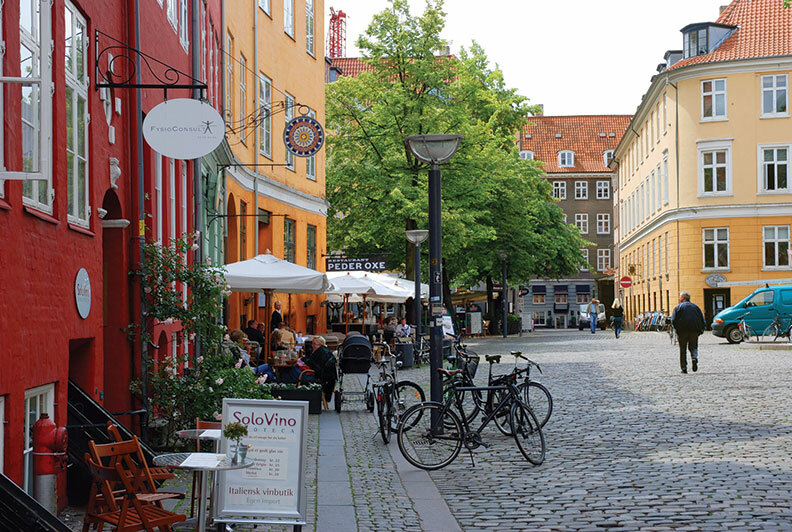 She’s a short stroll from Langelinie Cruise Pier and one of numerous attractions awaiting visitors to Copenhagen, a city whose residents know how to enjoy the little things in life. When you’re the former president of the United States and have been living inside a security bubble for the past eight years, where do you go to celebrate your newfound freedom? 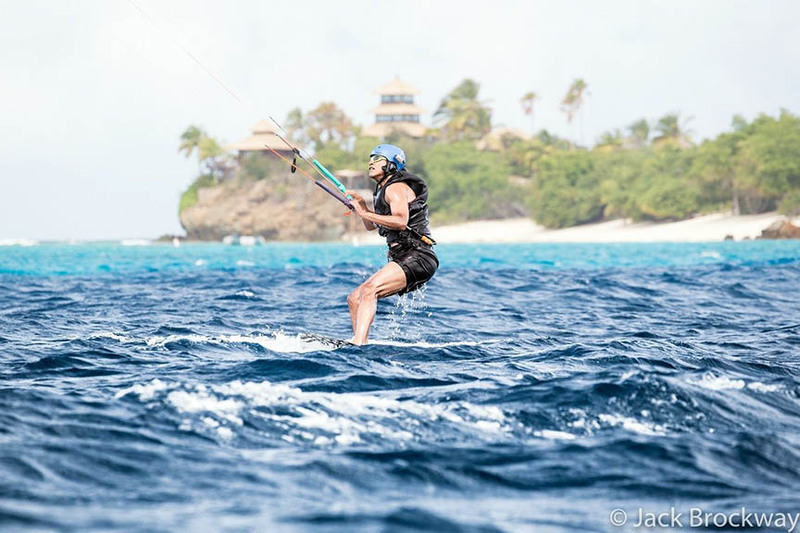 Barack Obama chose the British Virgin Islands, where, as a guest of Richard Branson, he tried his hand at kitesurfing off Moskito Island. This small private island will soon be joining Necker Island as an exclusive island retreat of Virgin Limited Edition, but there are other, more affordable ways to enjoy the BVI. 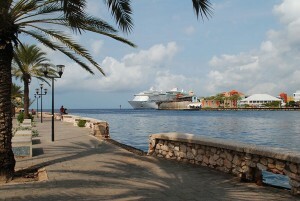 Another way to visit the BVI is on a cruise ship. 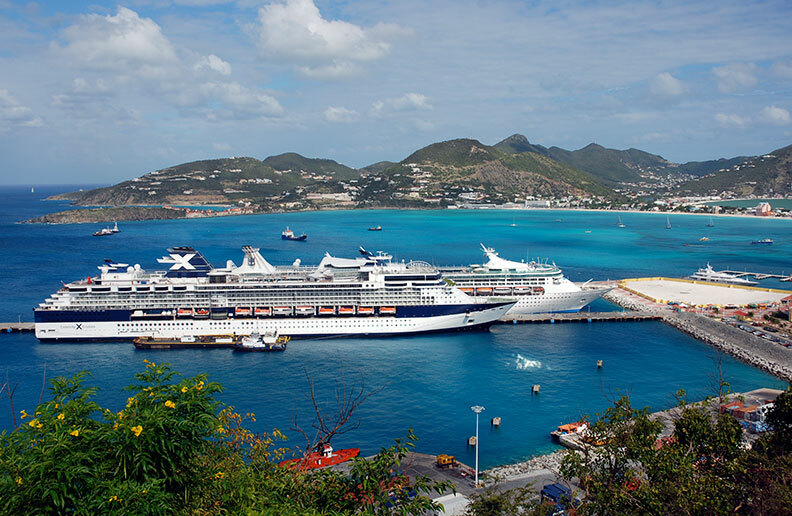 A variety of cruise lines call at Road Town on the island of Tortola, these ranging from contemporary megaships to mid-sized premium ships to luxury yachts. Tortola receives far fewer ship calls than busy St. Thomas in the neighboring U.S. Virgin Islands, but Tortola is well serviced with taxi companies and car rental firms. Cane Garden Bay is one of many beautiful beaches on Tortola. Shore excursions offered by the cruise lines include sightseeing in an open-sided safari bus and island-hopping by catamaran. Sailing, snorkeling and dive excursions are all featured, including one to the wreck of the Rhone, a 19th-century mail ship lying in 80 feet of water off Salt Island. The Baths on Virgin Gorda, a unique beach of giant boulders, sea caves and shallow pools, can also be visited by boat from Tortola. Christopher Columbus named the Virgin Islands in 1493, but Sir Francis Drake set the tone a century later when he sailed along the channel now bearing his name, which runs through the middle of the BVI. Rich in pirate lore, the BVI were a hideout for the Dutch pirate Jost Van Dyke and for Blackbeard, who is said to have marooned a dozen or so of his men with a bottle of rum on Dead Chest Island. Nearby Norman Island inspired Robert Louis Stevenson to write Treasure Island. 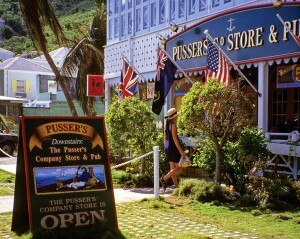 Pusser’s store and pub are popular stops in Road Town. First colonized by the Dutch, then annexed by the British in 1672, the BVI are today an overseas territory of the United Kingdom. English is the official language and the legal currency is the U.S. dollar. Pusser’s Co. Store in Road Town is the place to buy its famous Royal Navy Rum and the adjoining Pusser’s Pub is where you can enjoy an English-style pub lunch. Road Town is a charming port of shuttered wooden houses and shops trimmed with fretwork, its narrow streets just a short stroll from the cruise port. Half Moon Cay has a beautiful and soft white beach on which to enjoy a long walk. The palm-fringed cays of the Bahamas have long attracted a motley assortment of inhabitants – from pirates and salvagers to today’s seclusion-seeking celebrities, including Johnny Depp and the Aga Khan. For those of us who can’t afford such tropical solitude, the good news is that several cruise lines also own private Bahamian islands for the enjoyment of their passengers. Miami-based Norwegian Cruise Line pioneered the concept of the private island experience when it purchased Great Stirrup Cay in 1977. Other cruise lines have since followed suit. Royal Caribbean acquired the neighboring island of Little Stirrup Cay and changed its name to Coco Cay. Disney Cruise Line owns Castaway Cay, which was called Gorda Cay when Tom Hanks first encountered Daryl Hannah here in the 1980s movie Splash. 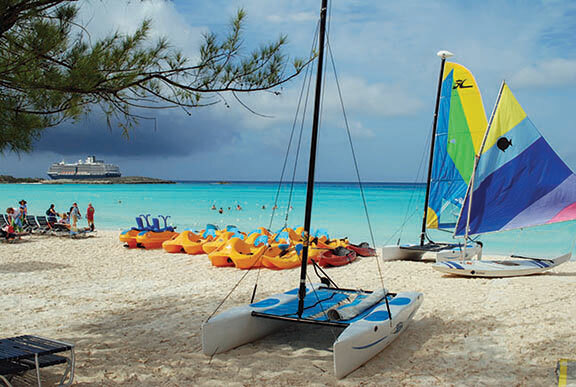 Princess Cays, owned by Princess Cruises, is a private beach resort located on the southern tip of Eleuthera Island. Nearby is Half Moon Cay, voted Best Private Island for 16 years running by readers of Porthole Cruise Magazine. Holland America Line ship at anchor near Half Moon Cay. Half Moon Cay is the private island I visited one March on an 11-day roundtrip cruise from Fort Lauderdale aboard Holland America Line’s Zuiderdam. This was our first port of call en route to the Panama Canal and the day ashore at this idyllic island proved to be the perfect place to kick back and unwind at the start of our cruise. Like most seaborne arrivals, our first glimpse of Halfmoon Cay was at dawn when a cluster of low-lying Bahamian islands gradually revealed themselves in the pearly pink glow of a rising sun. Only a few fellow passengers were on deck to watch while our ship slowly approached this small island lying between Eleuthera and Cat Island, where Sidney Poitier grew up. 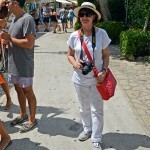 As the ship’s anchor was lowered, Bill and I headed to the lido for breakfast. While lingering over our morning coffee and croissants, we observed the first tenders taking passengers to the island. 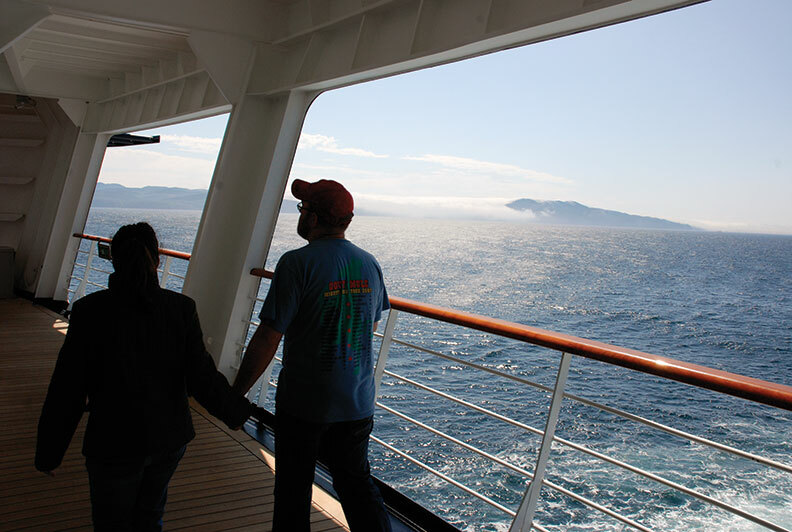 We hadn’t booked a shore excursion, so there was no need to rush ashore – which is just as well when you’re cruising with teenagers. By the time our boys were up and ready to go, there was no line-up for the tenders and we were soon disembarking at the island’s marina. 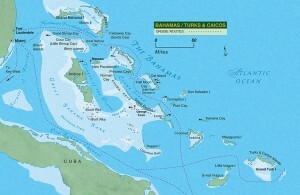 Map of Bahamas shows location of Half Moon Cay. Half Moon Cay, originally called Little San Salvador when purchased for $6 million by Holland America Line in 1996, was renamed for the 17th-century Dutch sailing ship captained by Henry Hudson. Upon acquiring Half Moon Cay, Holland America transformed this uninhabited island – used solely by nesting seabirds – into a unique port of call with its two-mile-long, crescent-shaped beach and shoreside attractions that include interpretive nature trails and a straw market run by locals from neighboring Eleuthera. 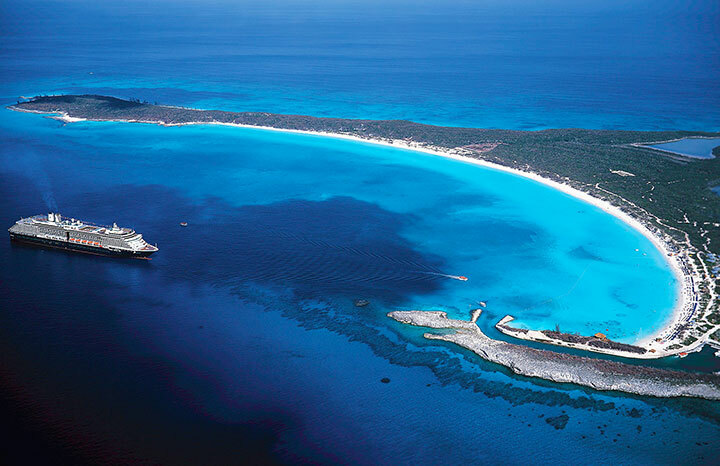 Best of all is the fact that Half Moon Cay’s pristine beauty has not been compromised. Designated a Wild Bird Reserve by the Bahamian National Trust, the island’s brackish lagoon is an important nesting ground for terns, shearwaters and herons. Only two percent of the 960-hectare island has been developed, with the rest preserved as a bird sanctuary. The sailing and watersports off the beach are safe and fun. After strolling the pathways that lead from the welcome center to various attractions, we headed toward the far end of the island’s beautiful beach and settled into some loungers near a watersports center. We’re a boating family and spend our B.C. summers out on the water, so the sight of Hobie Cats and Sunfish sailboats for rent by the hour immediately caught our attention. Bill and our younger boy, John, were soon pushing off from the beach in a Hobie Cat. They had a pleasant sail, tacking back and forth in the steady trade wind, enjoying the warm breeze before turning the boat’s bow back toward shore. At one point a tropical rain shower temporarily drove us from the beach to the shelter of the nearby Captain Morgan on the Rocks bar. Designed to resemble a washed-ashore pirate ship, this open-air bar was a great place to enjoy a refreshment and listen to live music provided by the ship’s band. At mid-day a barbecue luncheon was served in the nearby dining pavilion. By early afternoon it was time to leave Half Moon Cay. We caught one of the last tenders back to the ship, sorry to leave but soon talking about our next port of call as the Zuiderdam raised anchor and sailed for Orangested, Aruba.